Biotinylated Human VSIG8, Fc Tag (VS8-H82F2) is expressed from human 293 cells (HEK293). It contains AA Val 22 - Gly 263 (Accession # NP_001013683.1). The protein has a calculated MW of 55.5 kDa. The protein migrates as 60-66 kDa under reducing (R) condition (SDS-PAGE) due to glycosylation. Biotinylated Human VSIG8, Fc Tag on SDS-PAGE under reducing (R) condition. The gel was stained overnight with Coomassie Blue. The purity of the protein is greater than 95%. 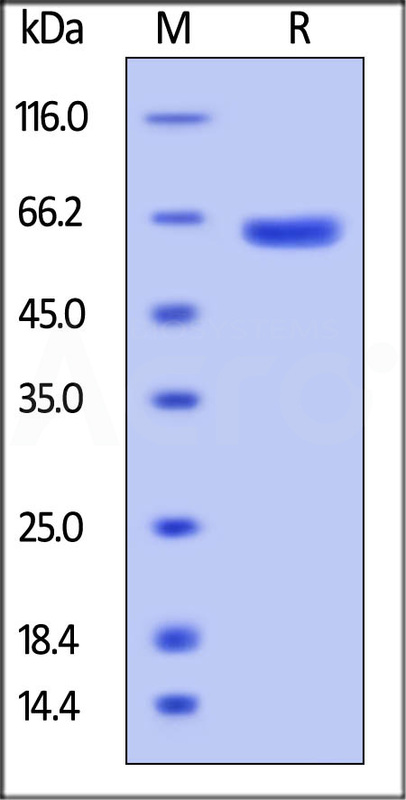 V-set and immunoglobulin domain containing 8 (VSIG8), also known as C1orf204, is a type I transmembrane protein of the B7 family within the Ig superfamily. VSIG8 was identified from proteomic analysis of human hair shafts. It is expressed in the hair follicle and shaft, superficial layers of the nail matrix, and superficial layers of oral epithelium. (1) Rice, R.H., et al., 2010, J. Proteome Res., 9: 6752-6758. (2) Lee, Y.J., et al., 2006, Mol. Cell. Proteomics, 5: 789-800. (3) Rice, R.H., et al., 2011, J. Invest. Dermatol., 131: 1936-1938.